Morgan Stanley CEO Jamie Dimon recently raised his forecast for rates on the Ten-Year Note, currently trading just below 3%, to 5%. He’d predicted a rally to 4% back in May but now thinks the bull market in stocks could run for another two or three years, putting additional upward pressure on long-term yields. 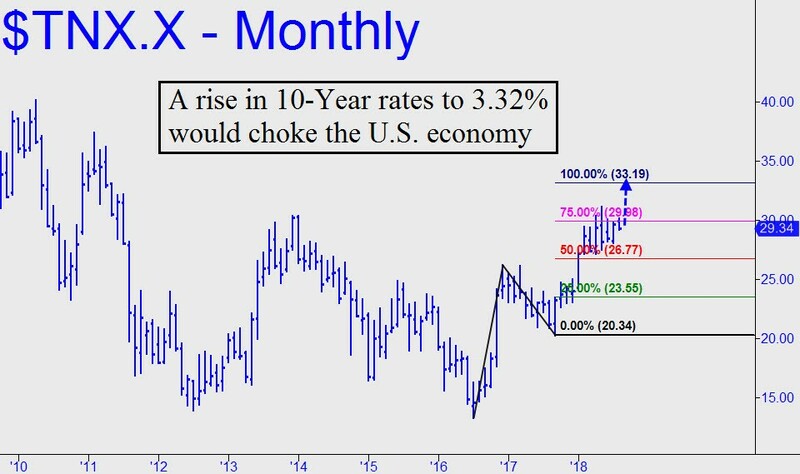 For its part, Rick’s Picks has told subscribers to expect a push soon above the 3.11% peak recorded back in May — a peak we had foreseen five months earlier when the Ten-Year Note was paying around 2.35%. We offered no specific target at the time but will now: 3.32%, as shown in today’s chart (see inset). It’s hard to square Dimon’s interest-rate forecast with the notion that the bull market in stocks has a few more years to run. Our gut feeling is that anything above 3.25% will asphyxiate the U.S. economy and send it into recession. The housing sector is already in a sharp downturn as reported here last week., and even a small turn of the interest-rate screw could asphyxiate it, along with auto leases. This would be a double whammy for the stock market, since mortgage rates have been held for a long time at levels that allow Americans to buy more home than they can afford. Similarly, car leases are structured so that we can drive more car than we can afford. The silver lining here turns out to be an unappealing scenario: rates go no higher than 3.50-4.00, but only because the U.S. economy has nosedived. If you don't subscribe to Rick's Picks, just click here for a free two-week trial. It will give you instant access not only to the chat room, but to actionable 'touts', intraday alerts, ‘jackpot’ bets using super-leveraged options and impromptu ‘requests’ sessions online.